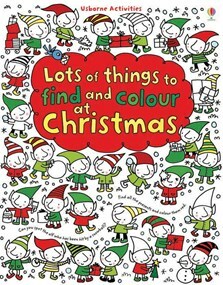 A bustling book full of busy Christmas-themed pictures to colour. There are lots of hidden things to spot and colour in, including skating penguins, dancing elves, presents, snowflakes, decorations and of course, Santa. An ideal book for keeping children busy in the exciting run-up to Christmas. Also features picture puzzles, including mazes, matching pairs and odd-ones-out. Would keep the fours-plus happy for hours on a wintry afternoon. This big, brilliant, bustling book is full of Christmas-themed pictures to colour and will go down a real treat with any child aged four and over. An ideal book for keeping children busy in the exciting run-up to Christmas. Just the thing for putting back the fun into learning! If you're looking for something to keep your child entertained in the (often exhausting) run-up to Christmas, then Usborne Books have released a wonderfully fun and extensive Christmas activity book into which they can channel their excitement!